Highlands Park is a subdivided part of the Highlands at Breckenridge and lies in the open meadows just south of the eastern section of the 27-hole public golf course in Breckenridge. Like the rest of The Highlands subdivisions, Highlands Park homes for sale are upscale, always custom built homes on large landscaped lots. Mountain ‘parks’ are common in Colorado. South Park is a big example, and it means an open area where the views are not obstructed by forests or steep ridges. Highlands Park is one of these kinds of park, not one with swings or basketball hoops. Read more about The Highlands at Breckenridge or check out the active Highlands Park real estate listings below. The Highlands is located north of downtown Breckenridge and on the east side of Highway 9. 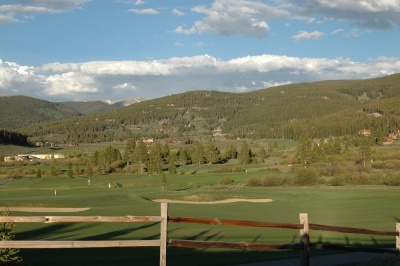 The Highlands Park subdivision is surrounded by neighborhoods of low-density and high-end development – Discovery Hill rises up to the south, Summit Estates on the east and the rest of the Highlands to the west – but the prominent landscape elements visible from Highlands Park is the large, green Breckenridge Public Golf Course, and the very high Tenmile Range that makes the western horizon. The Breckenridge Golf Course is steps away from most of the lots and homes for sale in Highlands Park, and the clubhouse is an easy drive. The course becomes the Gold Run Nordic Ski Center in the winter, and a member of the center could easily jump onto the groomed trails from any Highlands Park home. Additionally, the open space trails close to this subdivision are groomed and leads to more back-country ski and hiking trails. The Swan River is just north of Tiger Road, the main road to Highlands Park, and offers great fishing. In mountain parlance, a ‘park’ is an open area where the views are not obstructed by forests or steep ridges. Highlands Park is one of these kinds of park, not one with swings or basketball hoops. Size: 2267 sq. ft. to 7517 sq. ft.
From the traffic circle on the north side of Breckenridge, continue north for three miles to Tiger Road, continue east on Tiger Road for another one half mile and turn right on Gold Run Gulch where you’ll see the sign identifying Highlands Park. 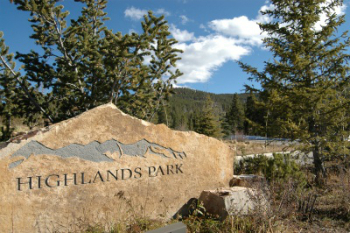 Do you have any questions about Highlands Park real estate listings or any other Breckenridge community? You can send us a message, or call us at (970) 453-2200 to speak with an expert!